Since August, residential real estate sales in Metro Vancouver have fallen between 30 per cent and 50 per cent below their 2018 levels. But it’s not a real estate slump — it’s a standoff that isn’t expected to last. On March 26, Business in Vancouver examined how to survive the slump in Greater Vancouver real estate in the first event of its new BIV Talks series, sponsored by the Downtown Vancouver Business Improvement Association. 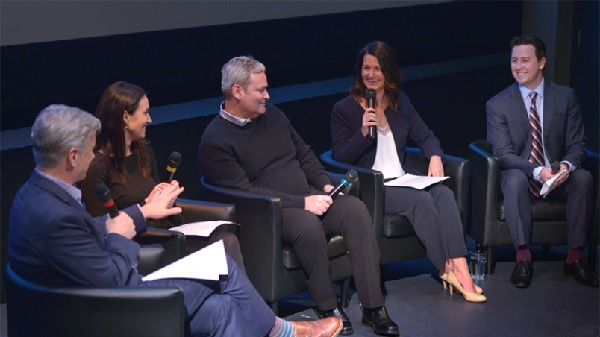 The four-person panel told an audience gathered at Vancity Theatre that investors — whether developers or first-time homebuyers — can now find value in a region rocked by real estate price and sales volatility. “If I were a purchaser, you know, I’d maintain my liquidity, because there’s going to be opportunities over the next 12 months,” said Lang. In terms of activity, expectations are not high. Cynthia Jagger, principal at Goodman, said the first quarter of 2019 has seen about a third of the apartment building sales that were registered in the same quarter the year before. Residential development site transactions are also down by more than 80 per cent year-over-year. However, she sees opportunity in strategic properties. Carla Guerrera, founder and CEO of Purpose Driven Development, Planning & Strategy, said brownfield sites are presently discounted and can offer value to buyers willing to tackle their complexity. Scott Brown, president and CEO of Fifth Avenue Real Estate Marketing, said this year will be the regional market’s fifth or sixth best year in the last decade. Beyond the market’s current slowdown, the discussion — moderated by BIV editor-in-chief Kirk LaPointe — tackled where the market may head over the longer term. Brown noted that headlines haven’t told the full story, that pockets within the region have continued to see activity and that there will be demand in niche areas, such as demand from seniors for mid-market rental spaces. Brown also argued the federal government’s most recent budget didn’t go far enough to address the market’s affordability concerns and supply constraints, and that the Canada Mortgage and Housing Corp.’s $1.25-billion home equity program will only drive more demand for products at the lower end of a price range that doesn’t exist in Vancouver’s downtown core. Guerrera saw the federal measures as a positive sign for Canadians. “I’m hopeful that these measures and these investments will give us more housing choices,” she said. More broadly, Lang pointed out that a growing population, limited land and persistent supply constraints will all affect the market. He predicted this may be one of the last opportunities for buyers to get in on single-family homes in the city. “They don’t make any more single-family in Vancouver,” he said. The panel also explored timing. As players reassess their strategies and reset their expectations, Goodman said, in the current slowdown — which she views as a standoff — buyers have some room to breathe and do their homework.